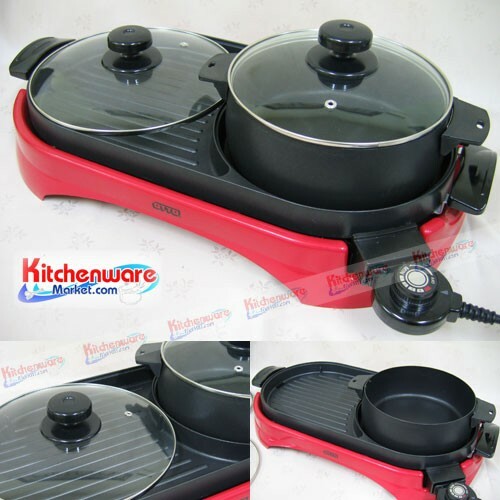 Sukiyaki- barbeque set with glass lids is perfect for household use. The set accommodate cooking since we can have suki yaki soup and bbq or grill at the same time. Oil drain is at the bbq plate for less fat. Oil tank is equipped and removable for draiing fat. The product certifies Thailand industrial standard TIS1509-2547. The product comes with 1 year warranty. Begin to use by make sure the heat knob is set at "Off" before plug-in power. Plug-in power and changing the heat at heat knob. During working, the indicator light may turn on and off to prevent overheat, according to the heat level set at heat knob. Do not use any metal utensil on the set, since the bbq plate and pot are all coated with nonstick material "Teflon". Do use wooden or high quality nylon utensil. After use, leave the plate to cool down and clean with clean clothes.